UP honors Vilma Santos with Gawad Plaridel – She was unforgettable as Burlesk Queen, as Sister Stella L and as Dolzura Cortez. On Monday, however, she was Vilma Santos, the artist. “Ako po pala ay nakapag-ambag na sa industriya,” said Rosa Vilma Santos as she accepted the Gawad Plaridel, a citation given by the University of the Philippines to media practitioners who excel in their profession. The award was named after Filipino propagandist Marcelo del Pilar who used the pen name Plaridel. “Paulit-ulit ko pong binasa ang citation,” Santos said. She is the first artist to receive the award for her contribution to the movie industry. In her lecture on the relevance of the film industry on society, Santos said actors can be role models through the various roles they play. She said she was able to internalize her role in the movie “Sister Stella L.,” a story of a nun who became an activist during the martial law years. “Totoong-totoo ‘yong sinabi ko sa Sister Stella L. na ngayon hindi na lang ako nanonood. Nakikisama na ako at tumutulong sa abot ng aking makakaya,” Santos said. She called on the public to support the local film industry. Santos, who acted in over 200 movies, said she owes her success to the film industry. She is now mayor of Lipa City in Batangas and is supporting the movie business by lowering the amusement tax in Lipa from 30 percent to 15 percent. She started her career when she was nine years old in the movie “Trudis Liit.” She, however, said the turning point came when she did “Burlesk Queen” when she was 23 years old. It was a tough decision, she said. She used to attend a school run by nuns. But it was a good choice, she said. “Ang pelikula pong ito ang nagpamulat sa akin sa maraming bagay,” she said. “Burlesk Queen,” shown in 1970, was a social commentary of the country’s patriarchal society. Recognizing Vilma Santos, thespian and nationalist – She is the grieving mother of sons to the struggle, linking arms and manning the front lines of a peaceful revolt. She is the mistress demanding the dignity deserving of a wife, a friend and a woman. She is the nun preaching the gospel of liberation against a dictatorship. She is the stripper dancing in tears as she lets go a love and a life never meant for one such as her. She is the single mom struggling to keep her wits amid domestic, financial and romantic dilemmas. She is the overseas worker facing down AIDS and its inevitable consequences. And she is Darna, a superhero fighting the giants, saving Ding and flying off to the stars. Burlesk Queen, Relasyon, Sinasamba Kita, Sister Stella L, Imortal, Dahil Mahal Kita: Dolzura Cortez Story, Bata, Bata . . . Paano Ka Ginawa?, Dekada ’70, not to mention Darna at Ding are just some of her countless films. Vilma Santos is all these and more. From the every woman to the other woman, she elevates every role as worthy of a superstar and every character as deserving of precise and passionate acting. She braves patriarchal traditions and murderous dictatorships to play burlesque dancers, mistresses and activist nuns. “She gambles her popularity to widen her scope as an actress,” proclaims Dr. Nicanor Tiongson, Dean of the College of Mass Communication of the University of the Philippines (UP). 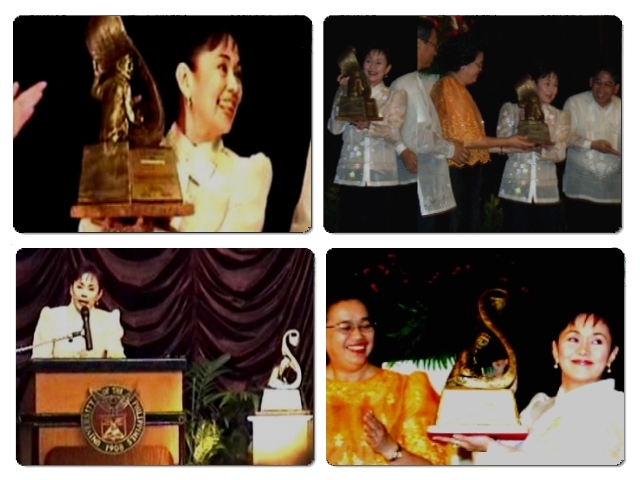 He adds, “She proves popularity and ratings need not degrade the craft.” For that and more, Vilma Santos wins the 2005 UP Gawad Plaridel Award. Santos received the award designed by National Artist for Sculpture Napoleon Abueva on July 4 in ceremonies at the Cine Adarna, UP Film Institute. Besides speeches, renditions of original movie soundtracks from Santos’s best loved films, as well as an insightful audiovisual presentation directed by Jun Austria, regaled audiences comprised of students, entertainment industry luminaries and fans who packed the venue. The Gawad Plaridel is an annual award to honor the exemplary media practitioners of the highest professional integrity in the interest of public service. Adopting the pen name of propagandist and La Solidaridad publisher Marcelo H. del Pilar, the award recognizes those who, like del Pilar, use the media to advocate libertine principles. Newspaper publisher Eugenia Apostol is the award’s first recipient. Now Vilma Santos joins the highly esteemed ranks of nationalist media professionals. The Gawad Plaridel validated that Santos has done just that. Her multifaceted portrayals of strong independent women have inspired those she has mirrored. Her portrayals of antidictatorship advocates have immortalized unsung heroes of the movement for generations to come. Her fearless gambles at parlaying her celebrity to triumph at portraying the most challenging of roles have set the mark for generations of actors. Vilma Santos is a class act, not by any accident of pedigree, but rather by the brilliance of her artistry and the strength of her convictions. Santos herself credits her success to “nonstop learning.” She remembers basking in the glow of a grand slam win at every major award-giving body for best actress with the movie Burlesk Queen. On her next movie with director Ishmael Bernal, she recalls a humbling experience she remembers to this day: “I took seven takes just for the first scene on the first day. I wasn’t focused. Bernal trapped me in the toilet and ordered me to jog in place to work off many illusions from my grand slam win.” The Gawad Plaridel recognizes Santos as a consummate thespian and nationalist. In an industry marred by dubious awards, it is the academe that remains the unimpeachable judges of exceptional talent and principle. 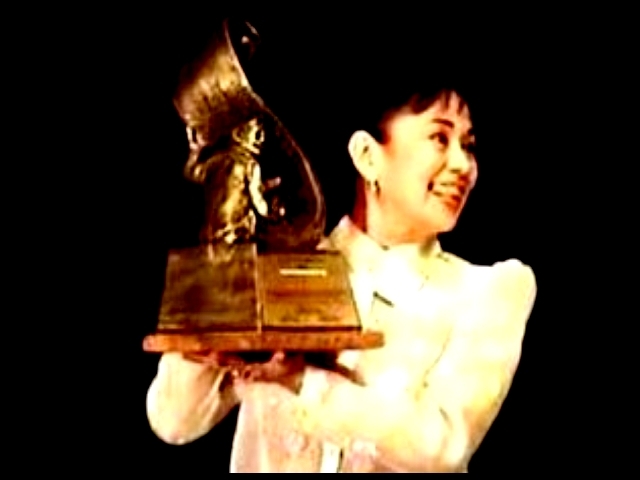 Vilma Santos: Plaridel Awardee 2005 – The UP Gawad Plaridel Awards 2005 is the only award in the University of the Philippines bestowed to outstanding media practitioners. It honors Filipino media practitioners in print, film, radio, television and new media, who have excelled and performed with the highest professional integrity and in the interest of public service. National Artist Napoleon Abueva conceptualized and molded the Plaridel trophy showing Marcelo H. del Pilar (the crusading journalist and editor of the vernacular section of Diariong Tagalog, the first Philippine bilingual newspaper, and the La Solidaridad, the reformist newspaper), which will be given to the awardee plus P100,000. Last year’s awardee was editor and publisher Mrs. Eugenia Duran-Apostol. This year, a film practitioner was to be distinguished among our many outstanding film practitioners. This entry was posted in ACHIEVEMENTS, ARTICLES and tagged philippine movies, Vilma Santos, Vilma Tuazon. Bookmark the permalink.